So my theme lately has been finding simple pleasures in everything. I really believe that line. I know that when my hands are idle, I’m open to negative energy. In an effort to keep myself busy, I’ve been discovering new things to keep me busy. I’ve really been working on expanding my crocheting. Monday, I learned how to do a celtic square. It’s a free pattern from Rivalry. It’s a free PDF download. At first it was a bit difficult to figure out. The written instructions don’t exactly tell you what you are working on. I finally just followed the pictures and pattern. I used Caron brand yarn. A bit flimsy, so I think I might try it with a stiffer yarn. I also want to work on the other three squares. The colors caught the attention of a lady who was getting a transfusion. She asked if my kids went to Mesa Ridge. I laughed and said no…not yet. Next year. She was a really interesting lady to talk to. I also have been working on another project. It’s called the Kumasi Throw. It’s a free pattern from Caron. I changed the colors a bit. I’ve also decided to tackle a project of a different sort for my sister. Next year her and her husband will celebrate their 15th anniversary. I wanted to make something special for them. I have the idea just need to map it out. I can’t wait to get started on it. Besides crocheting, I’ve gotten into cooking. Today my Bee and I made some yummy banana muffins. We decided to use an orange glaze for the top. We used fresh squeezed orange juice and powdered sugar. I don’t have any piping bags, but we made out own out of a lunch sack. Everyone loved them. Liked how moist they were. I haven’t had any….I don’t like bananas. They smelled good, just don’t care for the taste of bananas. We put the left over oranges into a sauce pan with a couple cinnamon sticks and cloves. Put it on simmer and the house smells so good! Bee and I also ventured into making our own tortillas for dinner. I put pork chops cut from the bone into the pressure cooker with a thin sliced yellow and orange pepper and an onion. I added cajan seasoning salt and pepper to the mix. We needed to do something different with pork chops and I decided to make a sort of fajita. We didn’t have any tortillas and with the weather turning yukie it was time to make our own. I’ve done it twice with my sister…can’t be that hard. Honestly they really were not hard. I do need to double the recipe next time. I had to make them a bit small, but they still worked great for tacos. Something I love most about my parents is that they take the time to connect to their grand children in unique ways. Each kiddos has a special “something” they get to do with gramma and papa. For two of my kiddos that “something” is music. We knew we had to leave on Sunday to get back home. Unfortunately, I had chemo the next day. Gramma managed to extend our time by making us enchiladas for lunch. When Dan and the other kiddos arrived, papa jumped on the chance to “jam” with Amanda and Andrew. Loving my dad’s pony tail lol!! Just seeing the smile on my dad’s face, the kids laughing at little mess ups, and the sparkle in all their eyes was worth the entire trip. Last weekend was just a blast!! The kids got an extra day off and we decided to leave Thursday night to go to Wyoming to spend the weekend with family. Amanda and I stayed at my Dad’s ranch and the rest of the family went to Dan’s parent’s house. We just needed to get away from life for a few days. We did just that!! Friday we got to spend the day with my mom. We started the day with a yummy hot breakfast. Man that woman can cook! We watched the skies and enjoyed a burst of winter. While we waited out the snow, Amanda played her sax for gramma and I played a bit with silhouettes. As quick as the snow came, it went. We decided that we were going to go play in the snow. Of course, we are never prepared for anything…had to barrow a bunch of winter clothes from gramma. Amanda and I tried to make a snowman, but the snow was just too dry. I can’t believe my bear is almost as tall as I am. Gramma put the camera down and came out to play. We grabbed the sled and tried sledding on a few of the hills. Then we decided to make snow angels. After a few hours of being outside gramma decided we needed lunch. She made us yummy nachos! After lunch, Bear and Gramma made a pumpkin roll and peanut butter cookies. I fell asleep in the recliner. They call it the melting chair. Melt I did! It sits right in front of the wood burning stove. The little kitty they have (pictured above) crawled in my lap and demanded I pet him. I woke up to gramma starting the one ton truck. I asked Amanda where gramma was headed. My dad had gotten his work truck stuck at the head gate coming into the ranch. After about an hour they came back. The head gate is quite the walk. I wanted to help, but knew I’d just be standing there. Bear fell asleep before 8:00pm. The rest of us watched Trouble with the Curve. EXCELLENT movie!! Friday night I couldn’t sleep much. The nerve pain in my feet was excruciating. Saturday didn’t fare any better. Every step I took was so painful. I was sad and disappointed because it was our S.A.N.D gathering. Ok this was a trip to take a picture of!! Every time I’d write this in the snow, Barretta would come along and walk through it! This is Barretta. I hope I spelled it right. She was someone’s glorified lawn ornament. Her previous owners decided it was more important to have her “barker” removed than to have current shots or to be spayed. Lisa and Jer rescued her. Jer is working with her to be a search and rescue dog. She is a fruit cake. After we cut two trees down (they needed to come down to make the road wider) and the truck was full of firewood it was lunch time! My sister made a yummy pork stew and mom made homemade chicken noodle soup. There was fresh bread, canned pickles, and homemade chocolate pudding. When our bellies were full it was time to go have fun! Don’t mess with the sista holding a hand gun! She rocks shooting one! Ok this is sad…. Because of the neuropathy in my hands I had a hard time pulling the trigger on the hand guns… I was stuck with the .22 lol. It’s a nice one. Henery lever action…fun! This is our adopted sister Ash. We were all soooo proud of her. 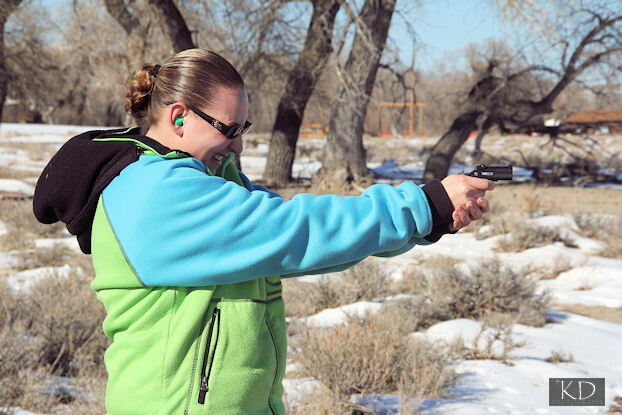 She’s never shot a hand gun before and she worked the courage up to do it. I know the first time I shot one I was scared and intimidated, but she hit the target 3 out of 5 her first try….look out! What an awesome day!! Good FOOD, Good FUN, Good Family times! I was so sad when the day ended! I miss being with my family. I can’t wait for the summer months to come. Lots of SAND times ahead! Last year my medical bills totaled 598,000.00. A half a million dollars in medical bills. This is doctors, surgeries, chemo, prescriptions… I realized that I need to count my blessings and be more grateful towards my husband’s employer. I know I’m guilty of taking for granted the things I have. This is one of them. I mean without insurance, who can afford that? It’s no secret. For many years we stayed in the military for the comforts of basic necessities. No matter what pickle we found ourselves in, we always have had a roof over our heads, food on the table, and medical care. There are so many families out there who can’t afford those things. The Army has provided insurance, the house we live in (BAH), the pay check to buy food. If anything we are the dumb ones. If we had managed ourselves better from the start we’d be further ahead. Live and Learn. Half of this year’s return is going to paying medical bills. I’m not on tricare prime. I’m on standard. When I took the assistant store manager job, I decided I had better change to standard in case something happen. Being in Wyoming, I was out of the network, unless I went to the local ER. With standard I have a 150 individual, 300 family, and 1000 cat cap. Basically, I have to pay out 1000 before Tricare pays 100%. The new fiscal year started in October. After one chemo treatment I met that cap. So I’ve been making payments towards that bill and we will pay it off. Just in time for the blazer to be paid off. We also took a personal loan over the summer to help cover the cost of gas. When it’s 174 miles round trip to Denver, three and four times a week, that adds up. That will be paid off in two months. Also, the washer will be paid for in a few months. Things are starting to finally get untangled. Enough that we are going to take the other half and buy some hockey tickets. The left overs….throw it in the pig for a rainy day. It feels good to get a little more freedom. When I took my job, we were almost doubling our income. At the start, every other weekend we were traveling out of town to Amber’s hockey tournaments. Once the tournaments were over I was looking forward to making a plan to tackle some of this stuff and put money aside for a nice family vacation…a real vacation. Sigh. All I’ve thought about for 9 months is getting back to work. Getting through chemo treatments, grow a little hair and get back to work. Now, I’m not so sure it’s that easy. The end of each cycle is getting harder and harder. I figured at some point it wouldn’t be a walk in the park. I have two weeks of “rest” coming up and it takes almost the entire two weeks just to get back to ¼ of what I used to be. The injuries from falling on the stairs aren’t healing because of the chemo. Well my foot I’m sure is healed. I am no longer wearing the boot unless I’m out and about. But I can stand on it without it hurting. The self repair of the torn tendon in my knee… not so good. Everything had been ok until this last week. I believe this is what Doc D was talking about. At one point it felt like someone drilled a hole in my knee cap and was pouring acid in there. It felt like I had re-torn it. I’m also concerned about further nerve damage. The last 24 hours have been hell. My feet and ankles have throbbed in pain. I’ve had a steady stream of electricity shooting in my leg… nerve pain. My feet have been numb off and on and my fingers are back to tingling. My hands are weak. Taxi and Gemzar cause nerve damage. Do I just push through these last two treatments? I don’t want to start something new. I just want to be done with this. Right now I’m holding my breath. Waiting to see if that awful back pain comes about. I pray that today – no pain or at least tolerable pain. Today is an important day for Bear. Today she gets to play with the Philadelphia Philharmonic. I was laying in bed last night almost in tears. I wanted to crawl outside my body and kick my carcass off the bed so I could sleep. All I could think about was what if this doesn’t go away. What if I miss the concert? Bear is understanding and forgiving…but I’m not. I’m taking drugs to make sure I’m at least ahead if it, if the pain decides to show. On a separate note, I’ll have a tripod to make a better recording of the concert than the last one. Today I plan to get some cleaning done and a little laundry. I think I might start making a plan for the garden. I’m not hopeful that we will get more moisture. I need to design a plan to be water efficient. I have tossed ideas around with my mom and dad. The ideal set up would be a root system, but that isn’t cheap.